Welcome to the latest highly exciting instalment of Who What Wear UK’s Best Wardrobes in Britain. It’s where we do exactly what that title says on the tin: delve into the most fantastical, awe-inspiring and downright influential wardrobes in this fair country of ours. We’re honing in on the women who cause the street style photographers to press their shutters as much as the characters you don’t yet know—the ones who fly under the radar with secretly incredible clothing collections. If there’s one brand that has really changed the look of every wedding, party and office over the past few years, it has to be Rixo. 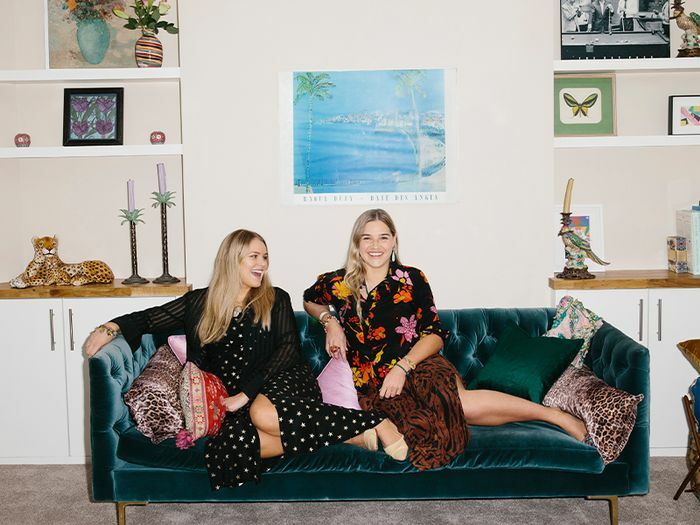 Henrietta Rix and Orlagh McCloskey are best friends who have built a fashion empire from their kitchen table in a matter of years. I recall being one of the first journalists in 2015 to meet with the pair after instantly connecting to the vintage-style lookbook they had hustled to shoot. Even though they only had a handful of samples at the time, it was plain to see that the girls had talent and that quitting their buying jobs wasn’t such an insane idea. The market was calling out for their aesthetic and their friendly price point for silk dresses you could wear to every occasion. Added to that, the two had an incredible work ethic and oodles of energy—one couldn’t help but love them, and I’ve cheered them on from the sidelines ever since. 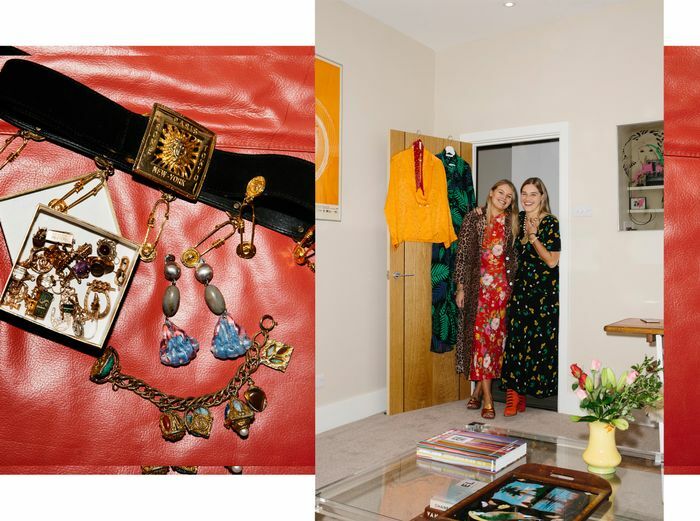 So I’m thrilled that the usually quite shy pair allowed Team Who What Wear UK into their flat to dive into the bulging wardrobes that inspire their collections. Phill Taylor; ON ORLAGH: Vintage dress; Rixo dress worn as a jacket; vintage shoes. ON HENRIETTA: Rixo dress; Charlotte Olympia boots. Do you have any early fashion memories? HENRIETTA RIX: Probably similar—just raiding my mum’s wardrobe and wanting to look a bit like her. I started going to vintage fairs with my mum when I was 10, so I’ve always loved it. But then I remember when the first Primark came to Manchester, and we used to get the Met into town and go there and mix Primark up with different bits and bobs, so that’s an early teen memory. OM: Oh, and Tammy as well! These flared jeans that B*Witched wore with embroidered stars shooting up the side, remember? OM: And also I wanted everything in Britney Spears’s wardrobe. Which leads me onto my next question nicely—who are your style icons? HR: Vintage Cher. All the icons like Jerry Hall, Bianca Jagger—all of Mick Jagger’s exes, I think. Plus, Jane Birkin, Jean Shrimpton—all the ’70s girls. Phill Taylor; ON ORLAGH: Vintage dress and shoes; RIXO scarf. ON HENRIETTA: Rixo dress; vintage jacket; Chanel shoes. At what point did you both start to be really aware of what you were choosing to wear? HR: I think it was from quite an early age, really. Even just noticing that my friendship group at school weren’t that bothered, whereas on the weekend I was always going out to find different things. OM: We didn’t have many vintage stores where I was from, but I knew I liked different things from other people. I used to use Google to try and find certain things that were older-looking, like “non-shiny jewellery,” but I didn’t know the term to type for. And then I found this one vintage store when I was around 15, and I used to get the bus up to Belfast to go there. I would always be cutting stuff and changing things, and my mum used to laugh every time I’d get the scissors out. So it sounds like your aesthetic has really been the same for quite some time; would you agree? HR: I think also our style isn’t really trend led, so we wouldn’t have one season where we’d be minimal or be something else the next. OM: And we have a really similar eye. We’d be in a vintage store and both pull out the same things. I think it’s quite eclectic. It’s always quite bright. It’s quite easy. HR: It’s not really that try-hard; it’s natural, I think! Do you have any fashion regrets? Outfits you look back on and cringe? HR: A Von Dutch cap I bought on eBay when I was 16 or 17! I don’t know what I was thinking. Awful. OM: Do you remember that programme on TV, The Salon? I was really young thinking this was the coolest thing ever; there was a girl who wore slouchy socks with court shoes and a pleated miniskirt, so I re-created that and wore it to a high school disco. It looked so awful, honestly. I think I tonged my hair and sprayed the curls pink—so bad. I’m imagining that when you first met, it was like a romantic movie scene—noticing each others’ outfits from across a room. Can you remember it? HR: I remember first meeting Orlagh. She came in late to the first lecture. I was like, Who’s that girl? She looks really cool, and we sat together. HR: The brown bag! I loved it. I wanted to be friends with her. OM: I had done a foundation art and design course at London College of Fashion first to go into fashion design, but I hated London in my first year, so I took a year out, worked in retail a bit, went to New York for a couple of months and worked over there. When I then reapplied and started fashion management, that’s when I met Hen. So was it a great moment to meet someone who shared the same passion and look as you during this time? HR: Definitely. If someone asked “What would you dream day be?” it would be finding a vintage shop! Phill Taylor; ON ORLAGH: Rixo shirt and dress; Vintage shoes. ON HENRIETTA: Rixo shirt and skirt; Prada shoes. As you’re both clearly vintage-shopping experts, what advice would you give to someone who’s nervous about it? OM: I think knowing where to go—like Portobello on a Friday morning—is key. It’s so good because all the dealers go then and you’ve got the best stuff. It’s not the kind of thing you’d get in Rokit; it’s, like, gorgeous slip dresses. I think also think 1stdibs is quite good to see things clearly, because sometimes when you go vintage shopping, it can be overwhelming; 1stdibs and Etsy are good to see things by themselves. HR: A lot of vintage can now be shopped on Instagram, and it’s been shot really nicely. OM: So if you can’t imagine how you’d wear it in a more contemporary way, you can really see it in these photographs. Phill Taylor ON ORLAGH: Vintage dress; RIXO blouse; Attico sandals. ON HENRIETTA: RIXO dress; Vintage jacket; Chanel shoes. With that in mind, do you share everything? Is there anything you’d just rather own yourself? HR: Because we’d never wear it in the same way, and we’re always sharing 24/7. OM: We’ve got different-sized feet, so some shoes work better than others. Mine are a little bit bigger, but that’s it. Are there any differences between how you’d wear the same item? OM: You put way more jewellery on than me. HR: Yeah, loads of earrings. And probably I’d wear something like Dr. Martens, whereas I can’t imagine you wearing Dr. Martens. Other than that, it’s very similar. Do either of you ever go “regular” shopping, say, on the high street? OM: Because we’re developing knitwear at the moment, any jumpers we own are in the office, and I don’t have an actual jumper to put on… So I went out specifically for that, but apart from that, we wouldn’t really ever go regular shopping. We’re just picking stuff up all the time, and it’s bad because I forget what I have… We don’t buy expensive items, but if we walk past a charity shop on the street, we have to go in. Just in case. HR: We often buy pieces for work because of the shape of a sleeve or a collar or embroidery, and it’s for Rixo development. And then naturally after a while, it falls back into our wardrobes and mixes in with new Rixo. So do you ever splurge, and if so, is there one particular big purchase that stays in mind? HR: I’m lucky I get my mum’s castoffs, because she does splurge! HR: I bought a gorgeous vintage kimono once, and it’s probably the most expensive vintage piece I’ve got. It was hand-painted from the ’30s and reversible, so I was probably convincing myself I could wear it one way and the other. I got it with some birthday money. Other than that, I just love the thrill of a bargain! So you both have very full wardrobes, but is there anything sentimental in there? OM: You know my charm bracelet with the little charms in the box? It was my mum’s—it was her first present from my dad, and she’s collected all of the charms. There are also some rings from when I was born. HR: Mine would be jewellery too—pieces my mum has also passed down to me.